Have your drinks in Disney Frozen style with Olaf the Snow Man and Snow Queen Elsa! 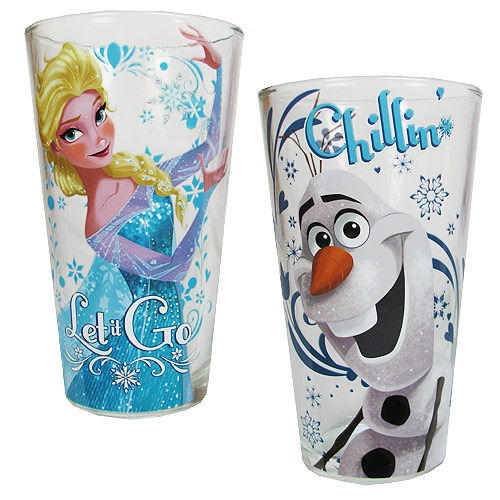 This Frozen Elsa Let it Go and Olaf Chillin Pint Glass 2-Pack features a separate pint glass each for Olaf and Elsa. Olaf's pint glass says "Chillin," while Elsa's says, "Let it go!" Able to hold up to 16 ounces of liquid each, you won't want to use any other pint glass ever again! Hand wash only. Not dishwasher safe. Do not microwave. Ages 12 and up.